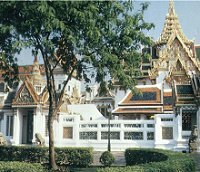 The first task undertaken by Rama I when he became King of Thailand was to start construction of the Grand Palace a large, walled compound in the heart of Bangkok. 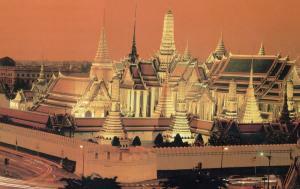 It is the most important spot in the nation and the most visited, both by the Thai people and by foreign visitors. The walls surr ounding the structures are nearly 6,300 feet (1,920 m) long. A double gate leads to the front court. To the left are three main buildings-and audience hall where various ceremonies are help, another hall used for coronations, and the residence of the first three Chakri kings. A throne is in the front of the audience hall, backed by a boat-shaped altar. A canopy over the throne is made of nine tiers of white cloth. The coronation chair, an octagonal seat, and an altar are the focus of attention in the next hall. While kings have not lived in the residence for many years, it is customary for a newly crowned sovereign to still recognize it as royal residence. A second group of buildings is called the Dusit group. The walls are white with many levels of steep green and red roofs pointing upward. Lightning-shapinials (ornaments) rise from each point and level of the roofs. In an audience hall in this group, a throne covered with mother- of-pearl is topped by another nine-tiere d canopy. The Chaki group of building was built by King Chulalongkorn (Rama V), who reigned at the turn of the twentieth century. A reception hall is used to greet foreign dignitaries and receptions, and many of the crystal decorations in this hall were gifts to King Chulalongkoru from foreign monarchs. The Boromabiman building was the royal residence for the next four kings. Rama VI was responsible for a group of frescoes illustrating the Vedic gods of Indai. The ten Kingly Virtues are written beneath the godes: giving, right conduct, personal sacrifice, honesty, humility, concentration, freedom from anger, freedom from malice, patience and avoidance of wrongdoing. A connecting gate leads from the royal residence to the grounds of the Royal Chapel of the Emerald Buddha (opposite, below. These grounds contain all the elephants of a monastery except a residential quarter. Monks do not live here. 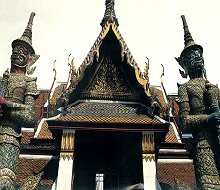 About two dozen other buildings and monuments stand within the Grand Palace compound. Several contain images of the Buddha and murals depicting his life. Statues of mythological animal and of elephants stand outside. Galleries surrounding the grounds are decorated with murals that tell the story of the Ramakian, the Thai version of the Indian epic Ramayana.